The Outer Banks. New Orleans. Surfer’s Point. Cape Shoalwater. All of these places may be swept away a hundred years from now but I’d be willing to bet you’ve only heard of the first three. 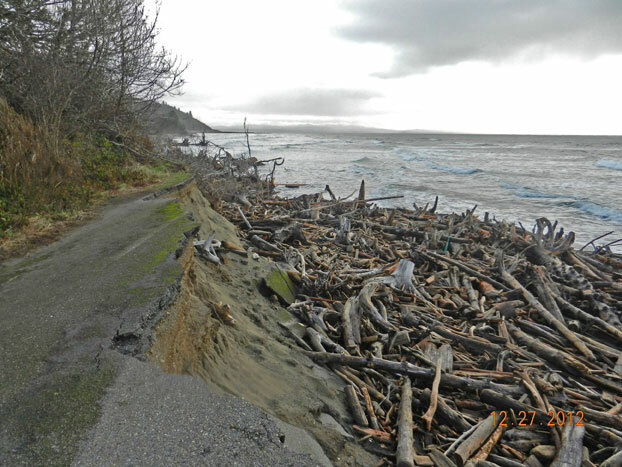 However, despite its relative anonymity, Cape Shoalwater, Washington is the fastest eroding stretch of land on the west coast, maybe even the entire Western Hemisphere. The stretch of coastline from the southern tip of Grays Harbor to the mouth of Willapa Bay is truly Washington State’s lost coast. Not only is it eroding at a phenomenal rate, but the American Dream died around these parts right around the time the spotted owl got itself endangered. On a rare sun drenched winter day I found myself driving down State Highway 105 past a steady stream of dilapidated trailers, the occasional cranberry bog and some very rustic beach cottages on my way to Cape Shoalwater, in particular a place known locally as Washaway Beach. What the 9th Ward is to New Orleans, Washaway Beach is to North Cove, albeit on a slightly smaller scale. Dilapidated ground water pipes and severed rebar poke out of the sand. 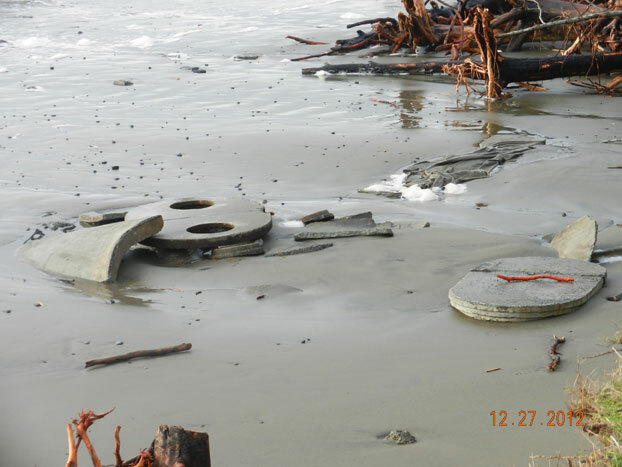 An old World War 2-era gun turret (that was later used as a septic tank, but that’s a different story) serves as a tidal pool during low tide. 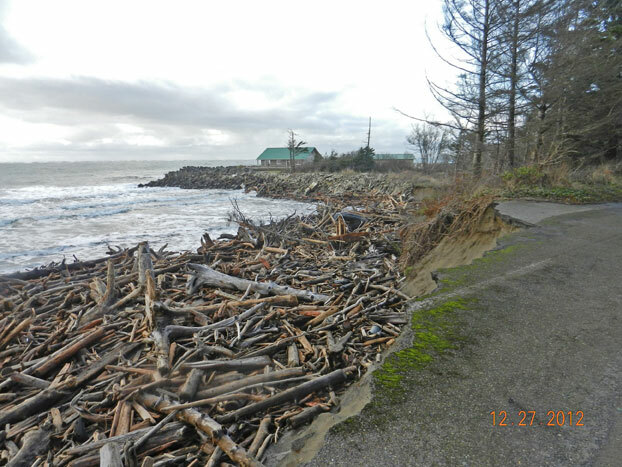 Freshly fallen Cedar and pine trees lounge on the beach, waiting to be carried away during the next winter storm. 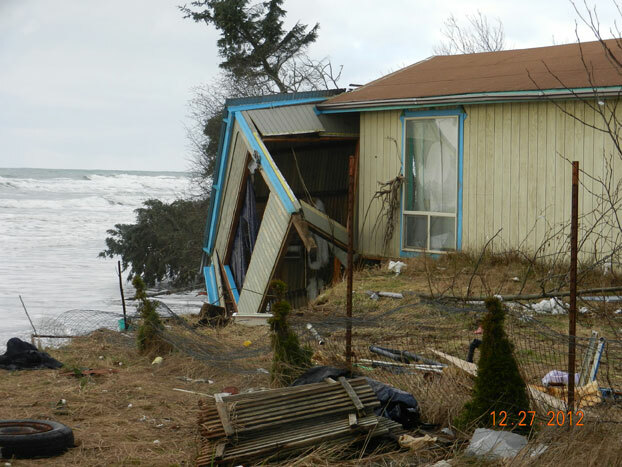 Condemned houses sit precariously on small bluffs, waiting to fall into the icy Pacific at any moment, serving as a constant reminder that at Washaway Beach it’s not if your house will fall into the ocean, it’s when. 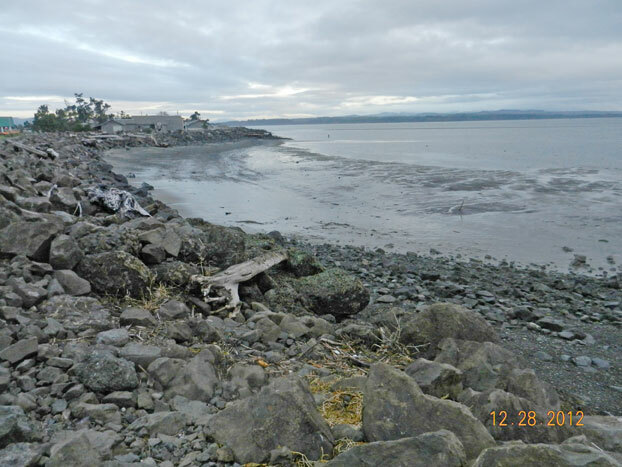 The mysterious case of the disappearing beach can be traced back to the year 1895, when the Army Corps of Engineers built the first jetty on the entrance to the Columbia River. Probably unbeknownst to them, the Corps had just altered the landscape of every beach lying to the north by changing the natural process of sediment migration. 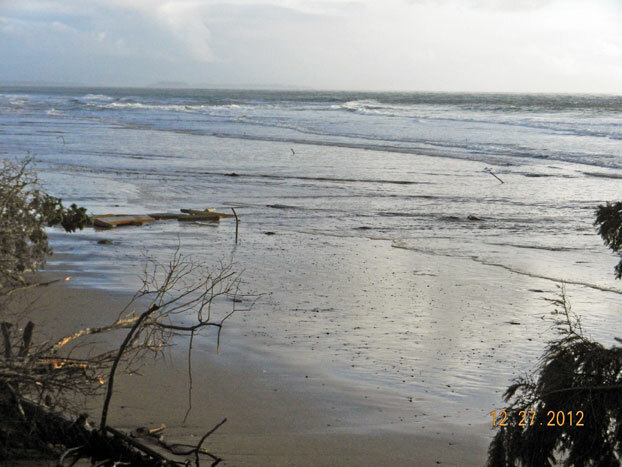 For thousands of years the beaches of the Pacific Northwest had relied on sand from the mighty Columbia to replenish themselves after a winter full of harsh, violent storms that ate away at the coastline. The jetty trapped and altered the flow of the sand, thus leaving the places like Shoalwater Bay starving for its natural defense against erosion. Years later the Corps exacerbated the already insufficient supply of sediment by dredging the entrance to Willapa Bay, creating a sizable channel. The new channel trapped any incoming sediment that was directed towards Cape Shoalwater. To top it off, 274 dams have been built on the Columbia River Basin in the last 80 years, trapping sediment intended for all Pacific Northwest beaches, not just Cape Shoalwater. In all, the carrying capacity for sands on the Columbia River has been reduced by 2/3rds. Much to the chagrin of the locals, the state and federal governments have done little to stop, or even slow down the erosion. Because of the low cost housing and the area’s impoverishment, North Cove is easy to ignore. In 1976, a local resident named Don Pickinpaugh fought to relocate the eroding Pioneer Cemetery. 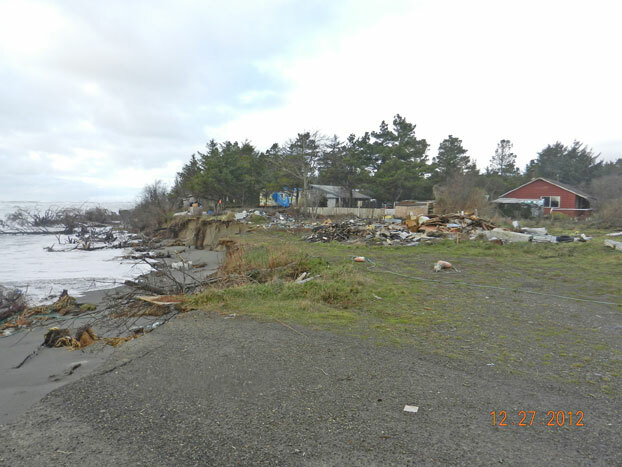 The Army Corps of Engineers recommended against structural solutions to the erosion problems because they were not economically justified and the environmental impacts were not known. The response from the Corps sums up condescending nature of local and federal government relations. The Corp’s response now sits on display at the local Tokeland Hotel while the Pioneer cemetery was moved across the highway. 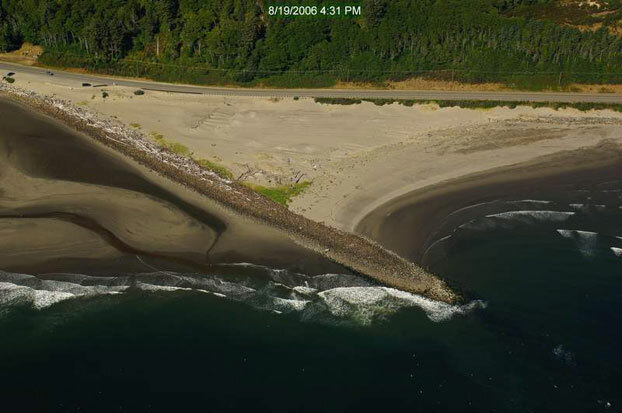 In 1995 the federal government was forced to step in when the expanding tidal channel threatened to undercut Highway 105, but their solution left many environmentalists shaking their heads. Led by a local cranberry farmer named Nick Wood, who coincidently lives next to the stretch of highway in question, lobbied the Federal Highway Administration to build $27 million dollar groin protecting Highway 105…and Nick Wood’s cranberry bogs. The groin is even more egregious when you consider for $13 million dollars more, or .034% of the FHA’s budget, Highway 105 could have been relocated…at the expense of Nick Wood’s cranberry bogs. Almost immediately after the groin was built, the Shoalwater Bay tribe’s square-mile reservation began to erode substantially. In response to pressure from the tribe, the Army Corps of Engineers pledged $12 million and implemented a plan to use dredged sand to replenish a barrier dune offshore of the reservation. Tune in next week when I interview Nick Wood and taste the world’s most expensive cranberries. The unwilingness of the Army Corps of Engineers hasn’t stopped the residents of North Cove from trying to save their homes. In the 1960’s locals built a makeshift jetty out of junk cars then proceeded to sue the Corps, claiming the dredging of Willipa Bay had directly influenced the erosion on Washaway Beach (which it had). The jetty was completely destroyed after the first winter storm and the lawsuit was eventually dismissed. 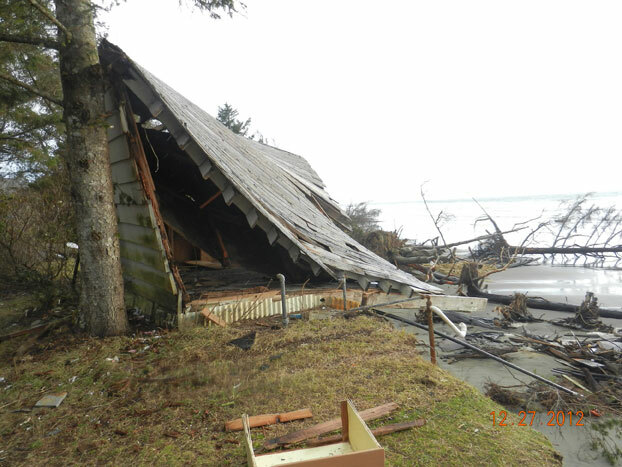 More recently, a concerned homeowner has built a large seawall around his house, much to the disdain of his neighbors. 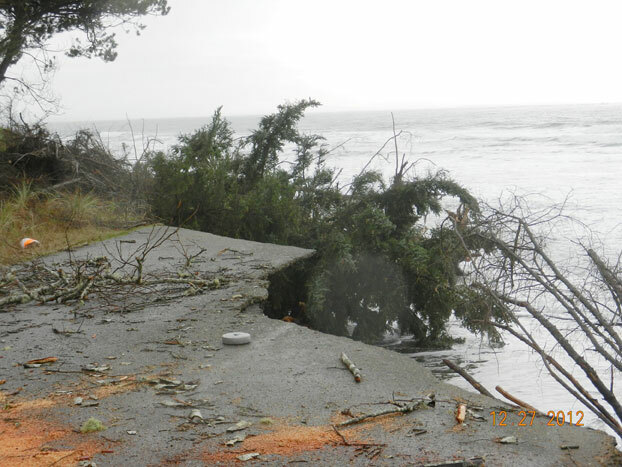 The seawall is apparently doing its job, but the property itself will be on an island sometime in the near future as the beach around it continues to retreat. Maybe if it were million dollar beach houses falling into the ocean instead of double wide trailers falling into the ocean things would be different. According to the National Oceanic and Atmospheric Administration the federal government spends an average of $150 million a year on beach re-nourishment and preventing erosion but the majority of the money goes to vacation getaways such as Palm Beach, Florida or Ventura, California. Two cities that will never be mistaken as North Cove. Meanwhile, life on Cape Shoalwater continues the way it has for the past century, the beach erodes, homes fall into the abyss while others wait their turn. 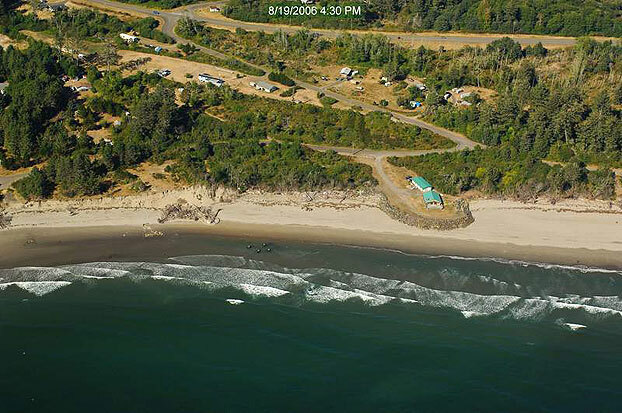 Residents don’t so much as own property, they lease it from the Pacific Ocean. In fact, North Cove might be the only place in America where housing is more expensive the further you get away from the beach. Mankind has always been fascinated by nature’s fury and no place is more adept to witness the wrath of a storm than Cape Shoalwater. Asked why people continue to live on such a fickle stretch of Earth, Ericka Langley replied, “It is a reminder of our place in nature. It is more powerful than we are. It is one of the great wild places in the Pacific Northwest.” Ms. Langley should enjoy it while it lasts.